Like other coprinoid mushrooms, Coprinopsis atramentaria has gills that turn black and eventually liquefy, creating an "ink." In fact, for many authors, Coprinopsis atramentaria is the "inky cap" that gives the coprinoid mushrooms their common name. Widespread and commonly encountered, it tends to grow in clusters from senescent root systems around stumps. 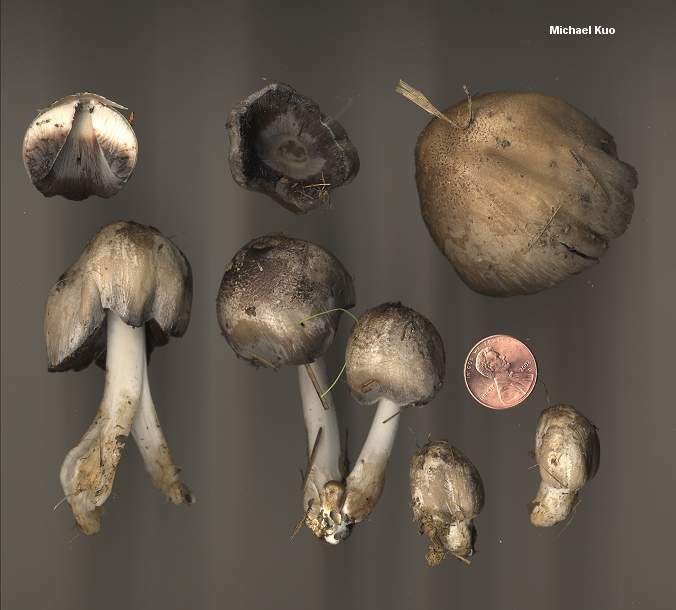 It has a gray to brownish gray cap that features a few tiny scales over the center but lacks prominent scales or the mica-like granules of Coprinellus micaceus. 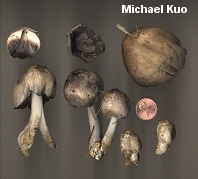 Several varieties of Coprinopsis atramentaria have been described. According to van de Bogart (1979), var. acuminata has scant veil and a bell-shaped cap, while var. crassivelata has an especially abundant and thick veil. 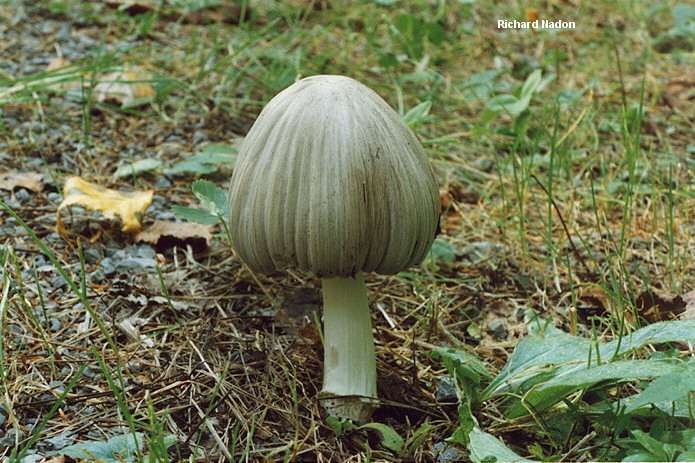 Uljé (2003) recognizes the former at the level of species, as Coprinus acuminatus. The scaly-capped Coprinopsis atramentaria var. squamosa is recognized by most authors as a separate species, Coprinopsis romagnesiana (which I suspect is also synonymous with van de Bogart's var. crassivelata). See van de Bogart's key to the species cluster for more information, as well as Uljé's key. 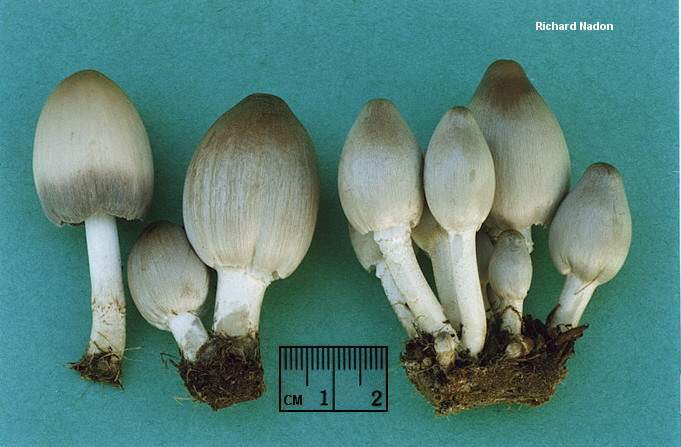 Coprinus atramentarius is a synonym. 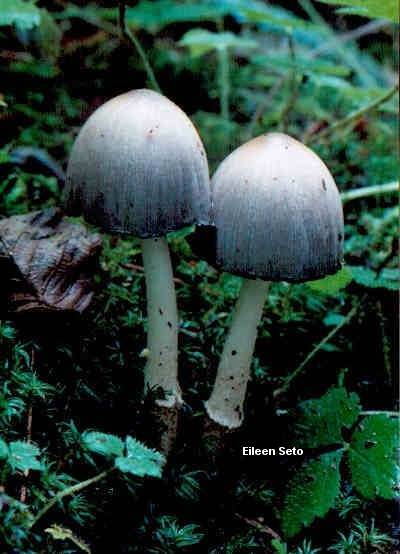 Ecology: Saprobic, growing in clusters on decaying wood (the wood may be buried, causing the mushrooms to appear terrestrial); often growing from senescent roots around stumps; spring, summer, and fall (sometimes in winter); frequently urban, but also found in woods; widely distributed in North America. Cap: 3-6 cm high and oval when young--expanding to conical-convex, up to 10 cm across; often with a curled up and/or tattered margin when mature; lead gray, grayish, or gray-brown; fairly smooth, but usually finely scaly to slightly scruffy over the center; faintly grooved/lined. Gills: Attached to the stem or free from it; whitish, becoming black; deliquescing (turning to black "ink"); close or crowded. Stem: 8-15 cm long; 6-12 mm thick; equal; smooth or finely hairy; white; fibrous; hollow. Flesh: White to pale gray throughout; thin; soft. Microscopic Features: Spores 6.5-10.5 x 4-6.5 µ; elliptical; smooth; with a central pore. Basidia 4-spored, surrounded by 3-6 brachybasidia. Pleurocystidia and cheilocystidia cylindric to utriform; up to 210 x 55 µ. Pileipellis a cutis. Veil elements tubular; up to 10 µ wide. Clamp connections present. REFERENCES: (Bulliard, 1786) Redhead, Vilgalys & Moncalvo, 2001. (Saccardo, 1887; Kauffman, 1918; Smith, 1975; van de Bogart, 1979; Smith, Smith & Weber, 1979; Weber & Smith, 1985; Arora, 1986; States, 1990; Phillips, 1991/2005; Lincoff, 1992; Metzler & Metzler, 1992; Horn, Kay & Abel, 1993; Breitenbach & Kranzlin, 1995; Evenson, 1997; Barron, 1999; Uljé, 2003; McNeil, 2006; Miller & Miller, 2006.) Herb. Kuo 11149403, 04220302, 10310704.